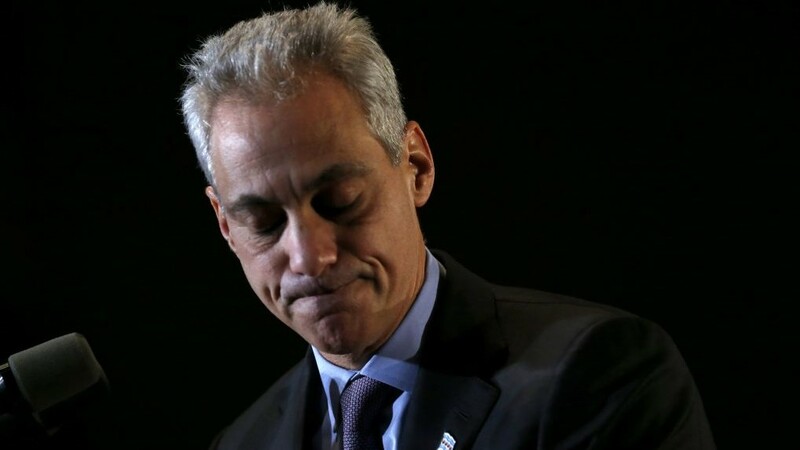 Is Rahm on his way out? Rats fleeing a sinking ship. That’s how a lot of people in Chicago are describing the wave of pink slips, resignations, and unexpected “retirements” of high-ranking Chicago cops and politicians. These days, it isn’t just longtime opponents but former supporters who are demanding the resignations of Mayor Rahm Emanuel and Cook County State’s Attorney Anita Alvarez for their roles in the cover-up of Laquan McDonald’s execution by Chicago cop Jason Van Dyke. According to a recent opinion poll, Emanuel’s job approval rating has dropped to 18 percent, just slightly ahead of congressional Republicans, and more than half of those surveyed say he should resign. The mayor’s handpicked Police Chief Garry McCarthy was the first to go within days after the horrifying video of McDonald’s execution was finally released. But with more revelations of the Chicago Police Department’s racism and brutality continuing to emerge, more heads will undoubtedly roll–and as unlikely as it might have seemed just weeks ago, Emanuel’s might be among them. For years, opponents of racist police violence have called out for justice for Rekia Boyd,Ronald Johnson, Dominique Franklin and the many other victims killed by Chicago cops. But police and politicians, backed up by the discredited Independent Police Review Authority, refused to do anything meaningful to address the city’s epidemic of police violence. Instead, they defended every last police murder and conspired to cover up crimes, while paying out more than half a billion dollars between 2004 and 2014 to families of the victims and survivors of police torture and other brutality, but on the condition that the CPD not have to admit guilt. Now, the video–released only because of a judge’s order–showing the cold-blooded execution of LaQuan McDonald has exposed the terrorism that the CPD inflicts on Black and Brown neighborhoods around the city on a daily basis. The McDonald murder has revealed more than just police racism, though. It has also exposed layers of corruption, incompetence and inaction, ranging from the Fraternal Order of Police, to City Hall and the mayor’s office, to even the federal Department of Justice (DoJ). The Department of Justice has begun a civil rights investigation of the CPD that is expected to take at least a year. But for Chicagoans familiar with the pattern of racist police violence, a year is a long time–a time span when the Chicago cops will add to the body count. And if DoJ consent decrees with police departments in other cities are any indication, no one should expect much from the Feds beyond a confirmation of what we already know: the cops are racist and the city’s priorities are upside down. Thus, the attempts to “rebuild trust” between Rahm Emanuel and the CPD and the people affected by police terrorism in Chicago’s neighborhoods are a non-starter. The unfolding political crisis threatening Emanuel is the city’s deepest in at least 30 years. But the Chicago police’s record of criminal corruption and racist violence goes back far longer. Not a decade has passed since its formation in the 1830s when the CPD wasn’t guilty of serial crimes against justice and civil rights. One of the original big-city police forces, the CPD has always been an unaccountable militia, whether targeting labor organizers, assassinating Black radicals or enforcing the apartheid system that has maintained Chicago’s status as one of the most segregated cities in the country. The first targets of the CPD were working-class immigrants. Six months after the department’s formation, Irish immigrants–then the city’s poorest ethnic group–accounted for two-thirds of the department’s 3,716 arrests. In 1855, Irish immigrants and refugees from political unrest in Germany were brutally attacked by the police during the Lager Beer Riot. As the city’s immigrant working class organized in neighborhoods and workplaces, a radical labor movement led by socialists and anarchists demanded workers’ rights and an eight-hour day. The CPD responded to the new movement with armed attacks on picket lines during the May Day protests of 1886, while cheering the executions of some of the city’s most popular working-class leaders: the Haymarket martyrs. Since then, wave after wave of corruption and scandal has erupted in the Chicago Police Department. The Palmer Raids of 1920 reached their apex in Chicago, with cops raiding union halls, bookstores and left-wing meetings. The “Red Squads” of the CPD continued to operate for the next six decades, with an elaborate system of spying, torture, disappearances–culminating in the executions of Black Panther leaders Fred Hampton and Mark Clark in 1969. For two decades, Lt. (later Commander) Jon Burge and his gang at Area Two and Three police headquarters tortured young Black men on the city’s South and West Sides–coerced confessions sent their victims to Illinois prisons and death row. Meanwhile, “the pride of the Chicago Police Department,” the Special Operations Section (SOS), was only disbanded in 2007 after engaging in routine armed violence, home invasions and kidnapping. Not only is the Chicago Police Department a scourge on the people of the city, especially Black and Brown people, but like a pig at the trough, the CPD gorges itself on 40 percent of the city government budget. All in all, a proven track record of racism, brutality and corruption. The eruption of protests since the release of the video of the execution of Laquan McDonald is averaging two a day, a testament to anger and bitterness in Chicago at the cops and the years of cover-ups by Rahm Emanuel, Anita Alvarez and others. Some in the movement against police violence–and, notably, some not part of the movement–are looking to the Department of Justice investigation to make a difference in the CPD. The Feds’ probe is a profound embarrassment to Emanuel, who used to boss around the DoJ as former White House chief of staff for Barack Obama–and that can only be celebrated. The announcement that it was underway confirmed the depth of the scandal facing the city establishment. But how much will a DoJ investigation do to change the police department? Would a consent decree imposed on the CPD be a step forward in the fight against police racism and brutality? Currently, police departments in 20 cities around the country operate under consent decrees agreed on by the federal and local governments. The agreements are essentially programs for self-reform, with the potential threat of a federal monitor to impose changes. Unsurprisingly, police violence has continued in the cities operating under these decrees. One of the “groundbreaking” agreements held up as a model for future consent decrees is Cincinnati’s “collaborative agreement” of 2002. Federal intervention was the result of the April 2001 murder of 19-year-old Timothy Thomas by a Cincinnati cop, which sparked days of rebellion. After filing a federal lawsuit against the Cincinnati Police Department, which had killed 14 other young Black men in the previous five years, the Cincinnati Black United Front, along with the ACLU, joined a “collaborative agreement” with the city and DoJ. The agreement promised “community-oriented policing,” reforms to the cops’ use-of-force guidelines, and an independent citizen’s complaint process. Again unsurprisingly, the city, under pressure from the Fraternal Order of Police (FOP),refused to hold up its end of the bargain. Activists had to file another lawsuit to compel the city and cops to comply. More than a decade later, following the police murder of Mike Brown in August 2014, the Department of Justice investigation into the Ferguson, Missouri, police departmentuncovered irrefutable evidence of police racism. Former Attorney General Eric Holder was only stating the obvious when he said, “Our investigation showed that Ferguson police officers routinely violate the Fourth Amendment in stopping people without reasonable suspicion, arresting them without probable cause and using unreasonable force against them.” Yet the Feds refused to file federal charges against Mike Brown’s murderer, Darren Wilson. The situation is little different in other cities. The Oakland Police Department has refused to comply with a federal consent decree for more than a decade, while continuing a spree of violence. Activists in New Orleans report that a consent decree there has yielded few results. So consent decrees are no magic bullet for fighting police brutality and corruption. They can be a tool for opponents of police violence–the more rules and regulations that we can force on police departments, the better–if that translates into fewer traffic stops, fewer stop-and-frisks and less police violence. But history shows that they produce far fewer results than most people hope for. In every instance of federal consent decrees and oversight agreements, the overwhelming obstacle to police reform has been the police themselves–with the Fraternal Order of Police (FOP) playing the most reactionary role in resisting change and accountability. For example, in response to Cincinnati’s collaborative agreement, the racist windbag FOP President Kenneth Fangman tried to pull out of the arrangement and encouraged officers to not do their jobs. Not only do contracts like these blatantly favor police over the people, but they put the burden of paying for this protection racket onto taxpayers. Jason Van Dyke, who had numerous complaints against him prior to the murder of Laquan McDonald, has personally cost the city $500,000 in settlements and legal fees. All told, the city paid $521 million in settlements and legal fees between 2004 and 2014. It’s no accident that the bar for getting police arrested, much less prosecuting them, remains so high. The FOP contract, known as the “Police Bill of Rights,” allows for cops to get information about investigations into their wrongdoing. In addition, cops who shoot civilians can delay making an official statement. In a justice system that operates disproportionately against poor and working people, particularly Black and Brown people, it’s especially hypocritical CPD officers, like those of any other police department, get an additional layer of due process that ordinary people don’t enjoy. All this creates an inherent barrier to accountability. This would be an elementary reform that would do more good than the consent decrees do: Police officers should not be allowed to wait before making a statement in the case of a shooting or any kind of assault. The FOP and law enforcement should not be above the law. The excuse for the special status of police is that officers do a dangerous job. But according to the Bureau of Labor Statistics, being a cop doesn’t even rank among the 10 most dangerous jobs in the U.S., and even then, only a fraction of police fatalities on the job occur from homicide. The job of being a cop would be even less risky if the seemingly endless funds for policing were reallocated to the communities that are both most heavily policed and most dramatically disadvantaged economically. That is what organizers, activists, and community members in Chicago have long demanded. The slogan #FundBlackFutures is not just another hashtag. It is the entry point to a conversation about creating structural change in communities that have historically suffered disinvestment and lack of resources. It offers a solution to the very real fact that the richest 100 U.S. families own as much wealth as all Black Americans combined. Instead of spending hundreds of millions of dollars on legal settlements for brutal cops, much less the vast sums devoted to police militarization and surveillance, the city of Chicago should devote resources to programs that create living-wage, union jobs. It should reopen the neighborhood public schools it has closed, along with mental health clinics and primary care health centers. In a city where the mayor and his handpicked school board closed a record number of public schools, where neighborhoods struggle without trauma or even basic health care centers, where Black home ownership rate was decimated during the financial crisis, and where unemployment rates are sky-high for the city’s Black youth, it’s unsurprising that gun violence plagues poor neighborhoods. Yet the city’s political leaders fixate on “gangs” as the source of the problem, while continuing to implement policies that exacerbate poverty and inequality. From status-quo machine politicians to “reformers,” they make the same tired demand to hire more cops–even though among the five biggest cities in the country, Chicago already has more cops per capita than any other. What will happen when the Department of Justice finishes its investigation? We know it won’t propose to re-open and fully fund public schools in our neighborhoods. It won’t call for quality, accessible health care as a right for every Chicagoan. It won’t prepare plans for a real jobs program, paid for by taxing the city’s major corporations and swollen financial sector. It won’t suggest a drastic cut in the CPD budget to pay reparations for everyone affected by police terror. These demands–and building a movement that can win them–are up to us. And in fact, over the past month, masses of people in Chicago’s streets have done more to hold the cops accountable than decades of legal wrangling and support for liberal political leaders. The power of the CPD and the politicians lies in the corporate boardrooms and City Hall. Our power is in the streets, in our schools and in our workplaces.